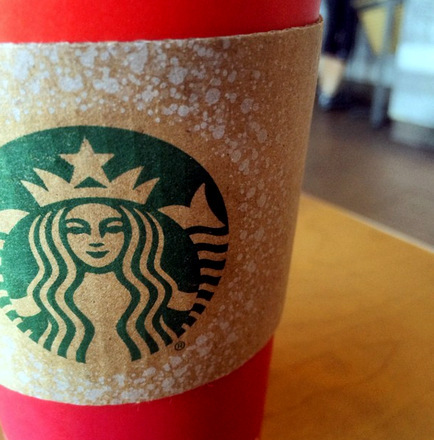 One of the new additions to the holiday lineup at Starbucks this year is the Gingerbread Tea Latte. The drink is made with Teavana English breakfast tea and sweetened with gingerbread syrup, then topped with steamed milk and a dusting of cinnamon. It’s a great idea not only because gingerbread is a wonderful holiday flavor, but because spotlighting a tea drink for the holiday season is a nice change of pace from the usual holiday favorites. I personally drink a lot of tea (not that I cut back on coffee…) when it is cold out and couldn’t wait to give this one a try. The drink has a nice black tea flavor and a hint of spices that include cinnamon and nutmeg. That said, it’s only slightly sweet and I would have mistaken it for a chai tea latte if I hadn’t known it was the gingerbread drink. I like that it is a lighter (figuratively speaking) alternative to the richer gingerbread latte, but would have liked to see even more gingerbread flavor. That’s nothing an extra pump of syrup can’t fix, however, when I’m in the mood for something sweeter. So-Cal residents might be wondering how this stacks up to the Coffee Bean Tea Lattes. The answer is that you can’t really compare the drinks. CBTL’s tea lattes are much sweeter and creamier, thanks to the powder that they mix in to the drinks. CBTL also uses their espresso machine to do a concentrated tea-extraction, which gives the drink a bolder tea flavor (no matter which tea you choose). If you’re used to the Coffee Bean version, this one might not be your cup of tea, but if you find CBTL’s to be on the sweet side, this milder holiday drink might be a new favorite.